Released on April 29, orders for the annually issued set reached 183,520 by May 4. That tops starting sales of 166,710 for last year’s set, although the first sales reporting period for it was two days shorter than this year’s set. Many of the Mint’s core proof sets and major products of silver have performed better in their starts this year, supported by collectors who have joined the Mint’s subscription program to receive a 10% discount and get products automatically when they are released. Also, while the price of silver is lower than a year ago, this year’s set, even with that taken into consideration and without the discount, is still less expensive than when last year’s set launched. As the table below shows, this year’s set with the discount built-in has the lowest premium in years. 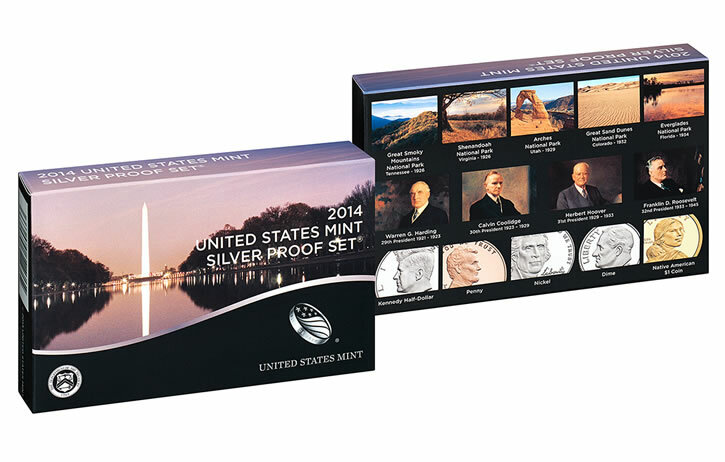 *The lower price and premium is for those who subscribed earlier in the year to receive the 2014 Silver Proof Set automatically on release. They received a 10% discount, paying $48.55 instead of the regular price of $53.95. As a point for consideration, pricing for the sets in years prior to 2014 have not been altogether different when adjusted for inflation and in accounting for changes in silver. As an example, silver’s cumulative average in 2008 was $14.99 an ounce, bottoming as low as $8.88 an ounce on October 24. At that point, the 2008 Silver Proof Set would have seemed exceptionally pricey at $44.95.